After my previous blog, in which I gave my reading and some thoughts about an Iranian tombstone dated 1101 and kept in the Los Angeles County Museum of Art, I want to go on down this path and consider another tombstone, kept in the same museum (accession number M.73.7.1). Again, the museum provides scarce information on the artefact. It does not even define whether the slab is a mihrab or a gravestone. Well, the design is consistent with that of the other gravestones from XII century Iran. So it should be a funerary stele, or something really similar. That’s true, it is beautiful to see, but why only enjoy its gorgeous inscriptions when we can also enjoy what it says? In this case I must admit that it has not been easy. 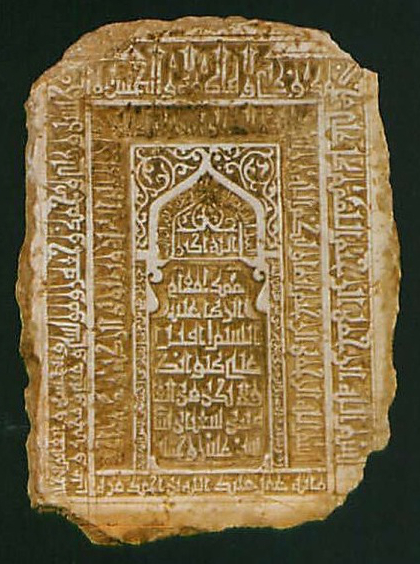 The script, particularly the one of the text inside the two-dimensional mihrab is not that clear. What information does the museum provide? 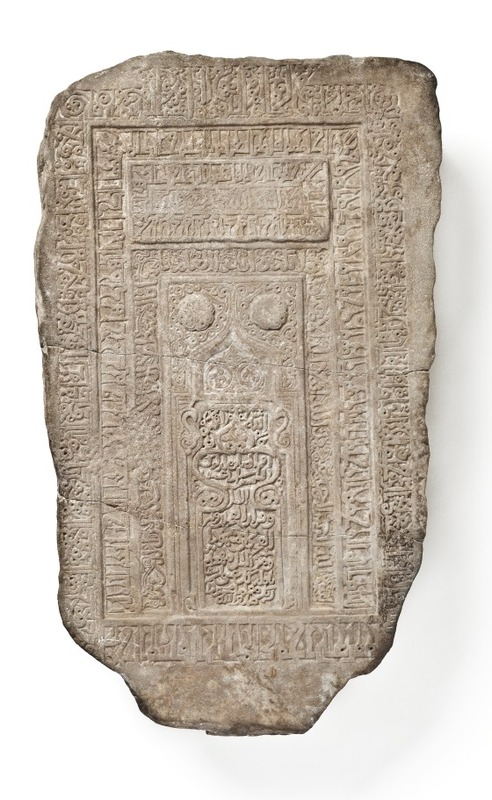 It is unclear whether this stone panel functioned as a tombstone or a mihrab (prayer niche), a characteristic element in mosques and other religious edifices. The mihrab is usually concave, but flat examples also occur. In fact, one is depicted at the center of this panel (they are also a common form of decoration on tombstones). The carved inscriptions that fill and surround the central niche may provide a clue to the panel’s purpose. They include quotations from the Qur’an, one of which refers to the act of prayer, suggesting that this object originally functioned as a mihrab. The elegant Kufic inscription at the base of the stone provides the signature of the artist, cAli Ahmad ibn (son of) Abu’l-Qasim al-Kharrat. 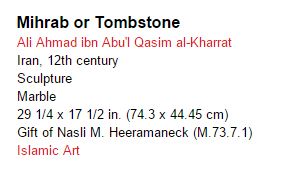 His father, Abu’l-Qasim al-Kharrat, was also a stone-carver, and his signature is preserved on two marble tombstones. Thus, from what’s written here I may conclude that someone actually read the slab and that the museum considers it most probably a mihrab, a prayer niche, even though it also admits that the image of the mihrab is also to be found in tombstones. 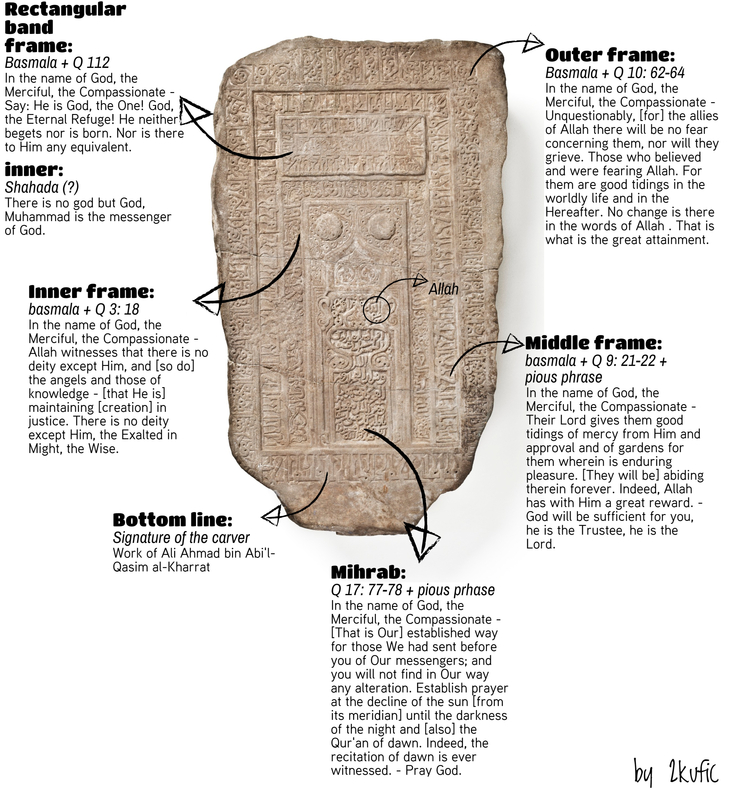 More interestingly, the author says that one of the quotations found on the slab clearly refers to the prayer (Q 17: 77-78), thus it would prove that the slab functioned as a mihrab. On the other hand, the name of the carver is clearly related to another carver, his father, who is known for his signature being on other two tombstones. Most probably the author here has in mind the tombstone in the Sackler Museum and in the Museum of Fine Arts in Boston . These two tombstones are dated respectively 511/1117 and 533/1138, so I think that this one, made by the son, can maybe be dated 54X-56X/114X-116X, more or less. I am stubborn, though, and I think that the slab should be related to a funerary context. Yet, it is weird to say “this slab is a tombstone”, since it does not bear any reference to a deceased. If we consider also the other inscriptions on the slab, we cannot but notice that the slab also contains clear references to a funerary context. Q 112 it’s a pretty common inscription in funerary inscriptions, and also in a variety of contexts, so it cannot tell us a lot about the function of the object. Q 3:18 on the other hand is particularly used in funerary inscriptions and for instance we also find it is another slab from 12th century Iran, kept in the same museum, and that I translated in the previous post. Also the other inscription, Q 9: 21-22, is related to a funerary context: the quotation stresses in particular the otherworldly reward for the pious Muslim and refers to the gardens where the pious soul will be abiding forever. Thus, to some extent the slab seems to function both as a prayer niche and as a gravestone. Which is strange, isn’t it? Well, we must now consider how the image of the mihrab is actually related to the funerary context: many gravestones, particularly those from 12th century Iran, include a representation of a two-dimensional prayer niche. Yet, the lack of any reference to the deceased let us reconsider ths function. Actually, Khoury, when dealing with the representation of the two-dimensional mihrab, wrote: “Two-dimensional objects that carry [the two-dimensional mihrab] are considered mihrab if they carry pious inscriptions, tombstones if their inscriptions contain funerary allusions. These classifications are, however, artificial, especially since a large number of mihrabs perform memorial functions” (p. 15). In the article, Khoury states that there is actually a third way to read objects bearing the image of a mihrab: as commemorative objects, often related to shrines or religious institutions. This kind of objects always share with the tombstones the “essential vocabulary of commemoration”. The LACMA sorrowfully do not provide information on the place where the slab was originally found, and maybe do not have such information, which is sorrowfully common. ‘Kind of’, of course, because I cannot be 100% sure. I can just assume that the slab in LACMA does not come from a graveyard, but from a shrine or a mausoleum. Its function was not to represent the prayer niche or fulfil a ritual function. I think it was a slab produced to be part of a commemorative structure. This would explain why the patron chose a tombstone-maker and opted for a gravestone-like design. It can also be added that maybe the commemorated person was quite important: not only the slab is carefully carved and rich of inscriptions and particular, but also the carver was the son of a maybe well-known carver, or of a productive carver of the time… the Giorgio Armani of the gravestones?